Mysterious And Known As The 'Raven': Scientists Identify New Whale Species : The Two-Way "There have been a lot of people out there surveying whales for a long time and never come across this," a researcher says. But Japanese fishermen have told stories about this dark whale for years. 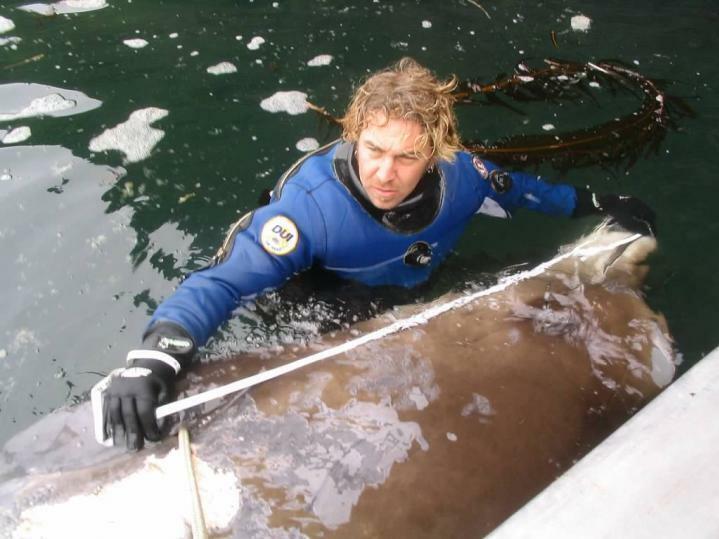 In 2004 Reid Brewer of the University of Alaska Southeast measured an unusual beaked whale that turned up dead in Alaska's Aleutian Islands. A tissue sample from the carcass later showed that the whale was one of the newly identified species. For decades, Japanese fishermen have told stories about the existence of a dark, rare beaked whale that they called karasu — the "raven." But now, scientists say they have genetic proof to back up these tales. Long mistaken for its relative, the Baird's beaked whale, scientists say it represents an entirely new species. "There have been a lot of people out there surveying whales for a long time and never come across this in scientific research," Phillip Morin, research molecular geneticist at the NOAA Southwest Fisheries Science Center, tells The Two-Way. "So it is a huge thing to discover this; it's kind of baffling that we haven't seen it before." The team's research was published Tuesday in Marine Mammal Science. Japanese scientists published a paper in 2013 suggesting that three whales that washed ashore in Japan might represent a different species but concluding that the sample size was too small — that further research was needed. This got Morin's attention. What followed was an effort that involved people all over the world to find more samples of the mysterious new whale. It was "like a mystery, sleuthing out what these samples are and where they were," he says. Some samples were hidden in plain sight. A whale skull from the new species was on display at the Smithsonian, incorrectly identified as a Baird's beaked whale. A Japanese scientist spotted it on a visit to the museum, Morin says. Also, a skeleton was found on display at an Alaska high school. The only skeleton of the new species in the United States hangs on display in Unalaska High School, in Alaska's Aleutian Islands. 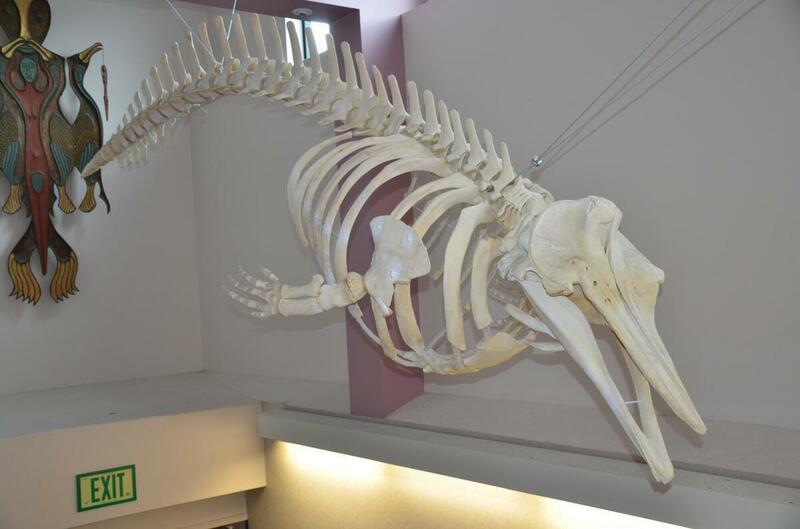 The whale was found dead in 2004, and recent tests on stored tissue samples revealed that it is one of the few known specimens of the new species. Two others were found at the NOAA Southwest Fisheries Science Center's collection, incorrectly labeled as Baird's whales. "A young biology teacher spotted the carcass half-buried in sand on a desolate windswept beach. He alerted a former fur seal researcher who presumed, at first, that she knew what they'd found: a Baird's beaked whale, a large, gray, deep-diving creature that occasionally washes in dead with the tide. "But a closer examination later showed that the flesh was too dark, the dorsal fin too big and floppy. The animal was too short to be an adult, but its teeth were worn and yellowed with age." Molin says the St. George specimen proved important because "the number of samples we have are very small." And because it was a full-grown animal, it gave the researchers an idea about its length: only two-thirds the size of a Baird's beaked whale as an adult. Other differences: "It reportedly has a different shaped skull and maybe a shorter beak than a Baird's beaked whale, relative to the shape of its head. And the dorsal fin is reported to be placed slightly differently, and differently shaped," Morin says. They're also "pretty cryptic" and spend a lot of time in very deep waters, he adds. The mysterious whale has never been spotted alive by scientists. Traditionally, species identification involves "detailed measurements and description of a physical specimen," Morin says. "But with whales, that's a really difficult thing to do. And with a whale as rare as this, it's even more difficult because we just don't have those materials." He explains that they're using "genetics as a line of evidence" to prove the existence of a new species. There were two previously known types of beaked whale — Baird's, which resides in the Northern Hemisphere, and Arnoux's, which lives in the Southern Hemisphere. The scientists said in their article that the two known species "share a common ancestor more recently than they do with the black form." "We're using more and more technologies to get us there — but as some people have said, we know more about the surface of the moon than we do about the bottom of the ocean. That's a huge amount of space to investigate. ... There's all sorts of different ways we can use technologies to explore the oceans, but it's still going to be a long process and we're going to continue to discover things. Probably not a lot of large whales, but who knows? It wouldn't surprise me if there were more whales that we've never documented before."